← Using Our Time Well. 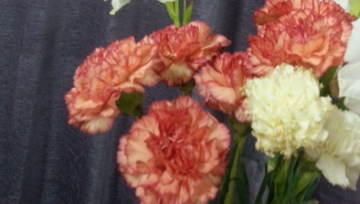 There are carnations in my room. And they’re fading. In shades of peach and pink. Fading, ever so gracefully. A few days old, and still so beautiful. It inspires me. What a way to live ! And age. And travel. These flowers celebrate life. We searched for the perfect shade and then saw as the peach flowers added so many smiles to a joyful occasion. The subtle beauty that the eyes glance over, the layer of charm that emanates. God has made all this beauty for our souls to rejoice over ! How fantastic is the Creator ! I took some of this beauty home, and put the carnations in a vase. And the loveliness only grew further. Away from their homes of mud and water, away from the light of the sun and the freshness of open air, and still so pretty ! Can I be anywhere, and still retain the joy of Home ? Can we go anywhere and not struggle? Flow. I read recently, our lives can be our work of art. Everyday. The work we do. The people we meet. The lives we touch. Aside | This entry was posted in Gratitude, Happiness and tagged grace, joy, life. Bookmark the permalink.